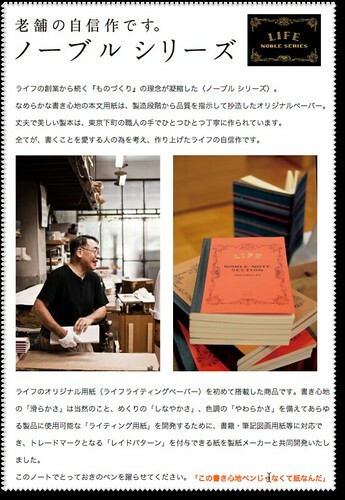 These were the original notebooks to include L!FE’s “LIFE Writing Paper”. Smoothness of writing is a given, but the paper is also supple when turning the pages, and softly colored to look at. This paper can be used in various products, including publications, notetaking, drawing etc, and has a trademarked laid pattern developed with a paper manufacturer. We hope you’ll have your pens dance on our paper. The “laid” paper in the above is written as レイド on the site, so it is not easy to find the English equivalent because of the fact Japanese don’t have r’s and l’s in their speech. From doing a little research, it turns out that ”laid paper” is writing paper that is characterized by having a watermark of lines or ribs, running across its grain. 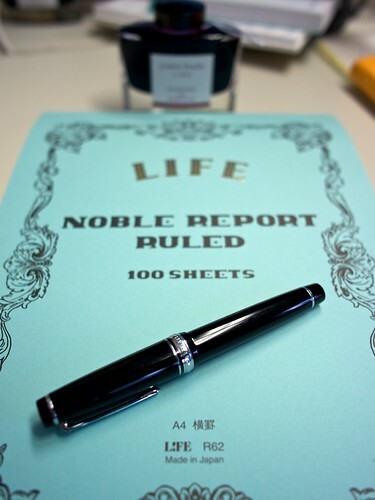 LIFE Inc NOBLE Note features high-quality paper.